$10.00 per day, $27.00 for 3 day/weekend entry. 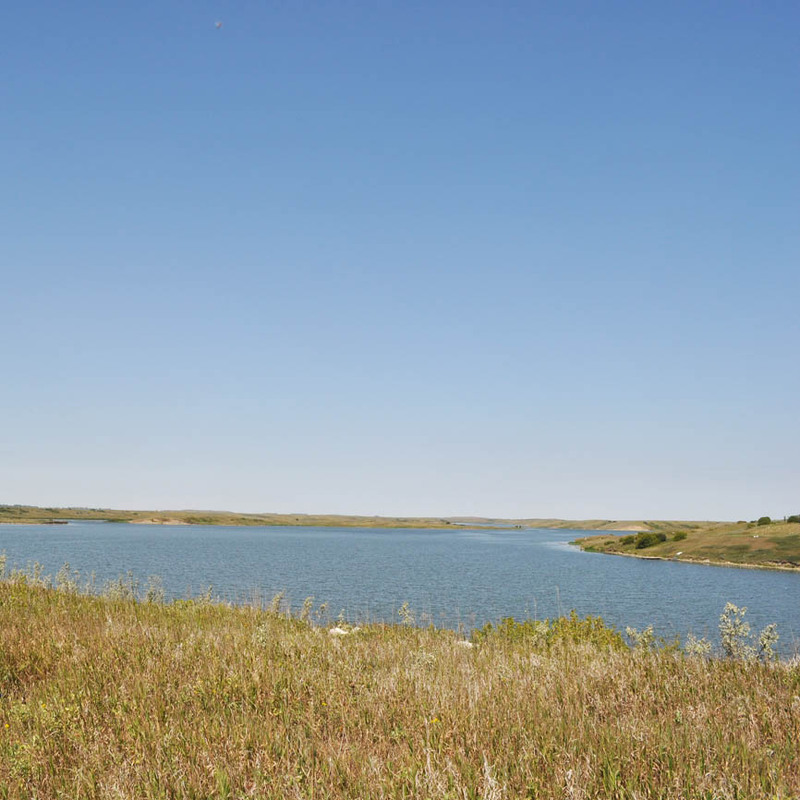 Mainprize Regional Park was molded out of the rolling, prairie wool covered hills and is located adjacent to the Rafferty Reservoir which is a 55 km long body of water created by the building of the Rafferty Dam just west of Estevan. 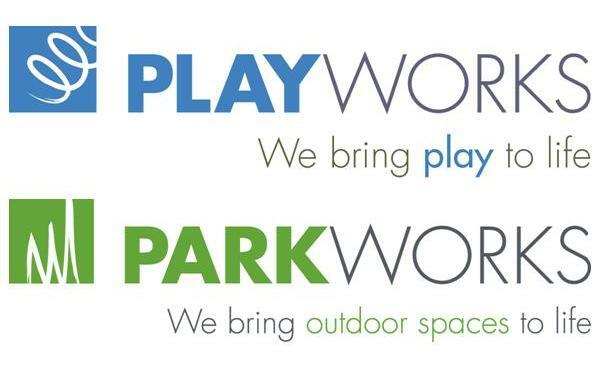 Today the park is a hub of activity driven by the development of 4 home/cottage subdivisions, 38 park model/R.V. 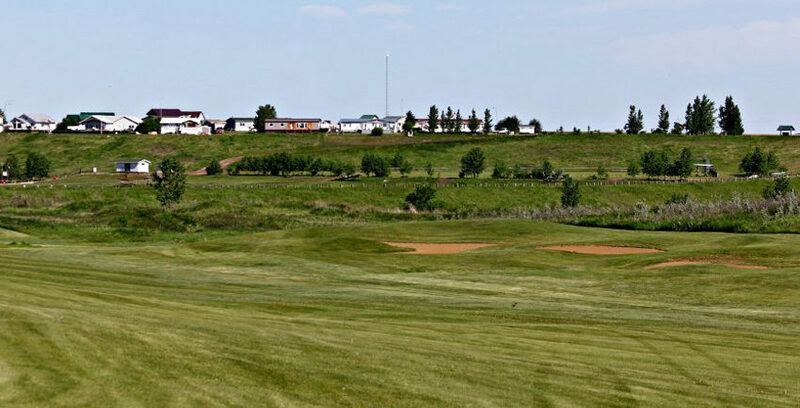 sites, 190 full season campsites, 50 short term campsites and an 18 hole professionally designed links golf course. The course is back in pristine condition following the flood of 2011. 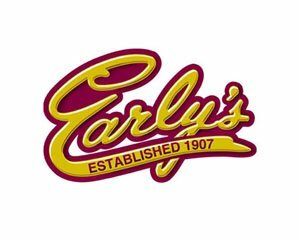 A privately owned and operated Bed and Breakfast plus 9 overnight rental cabins gives you the opportunity to stay and play just one more day. The concrete boat launch (4 place) and the launch store stocked with all fishing and confectionery items will add to your days boating experience. 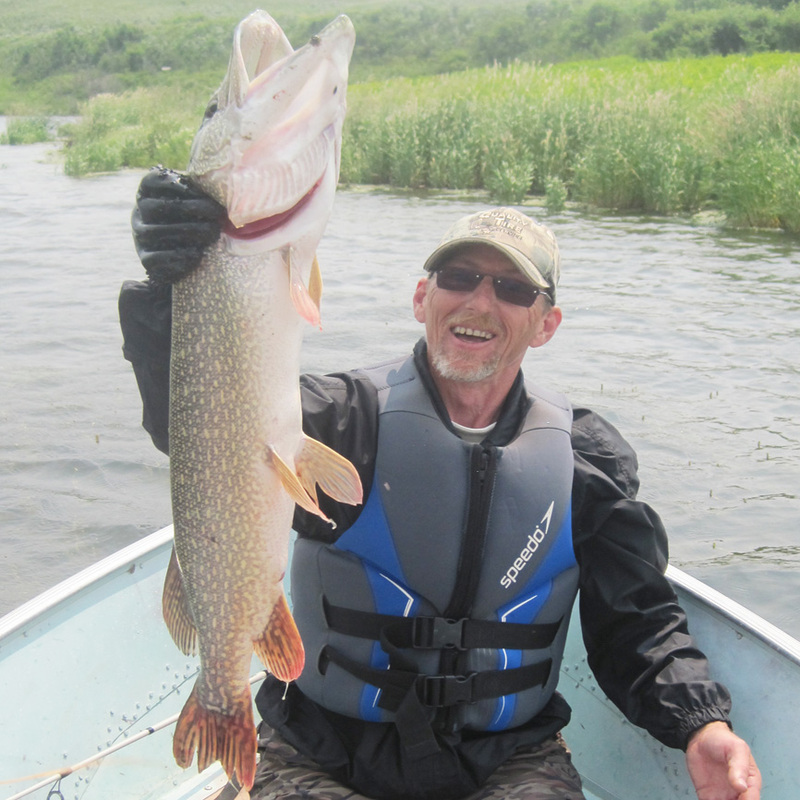 The excellent walleye, pike and perch fishing has made the lake one of Saskatchewan's fishing hotspots. If a lazy day in the sun is in order, the beach has 6 sun shelters equipped with picnic tables, barbecues and a large irrigated grassed area. 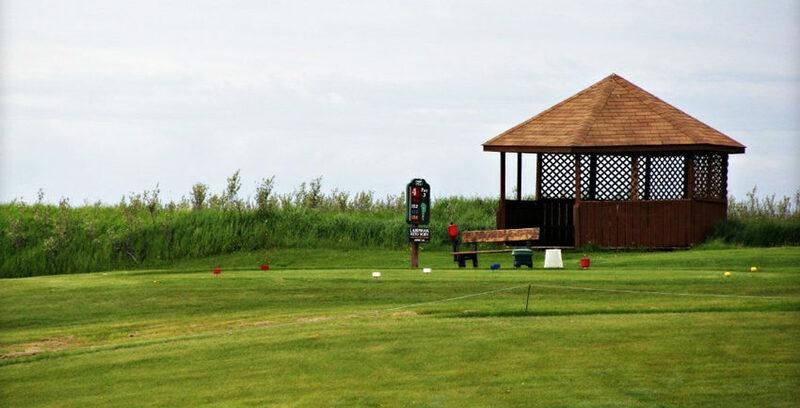 The park is truthfully an oasis amidst the provinces oil patch and those that have tested their golf skills on the links claim - it is the only place in Saskatchewan that you can get a peek of Scotland. Midale: Quick Stop Fuel and Confectionery, North Eden (Asian/Canadian Cuisine), Mainprize Manor Medical Services. 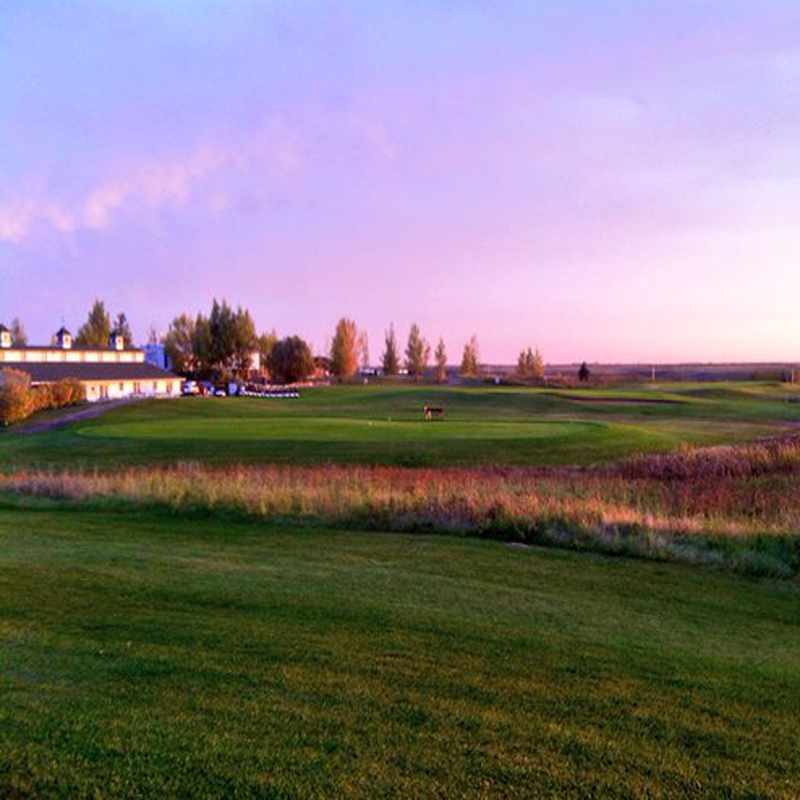 Weyburn: 18 hole golf course, numerous hotels and restaurants, hospital. 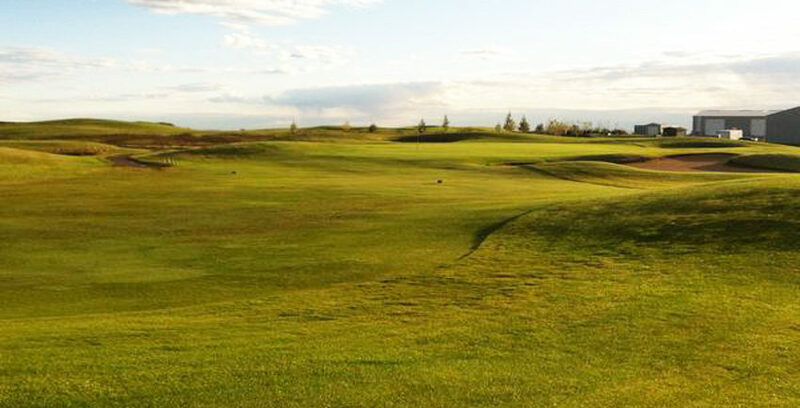 Estevan: 18 hole golf course, nine hole executive golf course, numerous hotels and restaurants, hospital. Mainprize Regional Park was named after Dr. William Mainprize who faithfully served the Midale community for over 50 years. 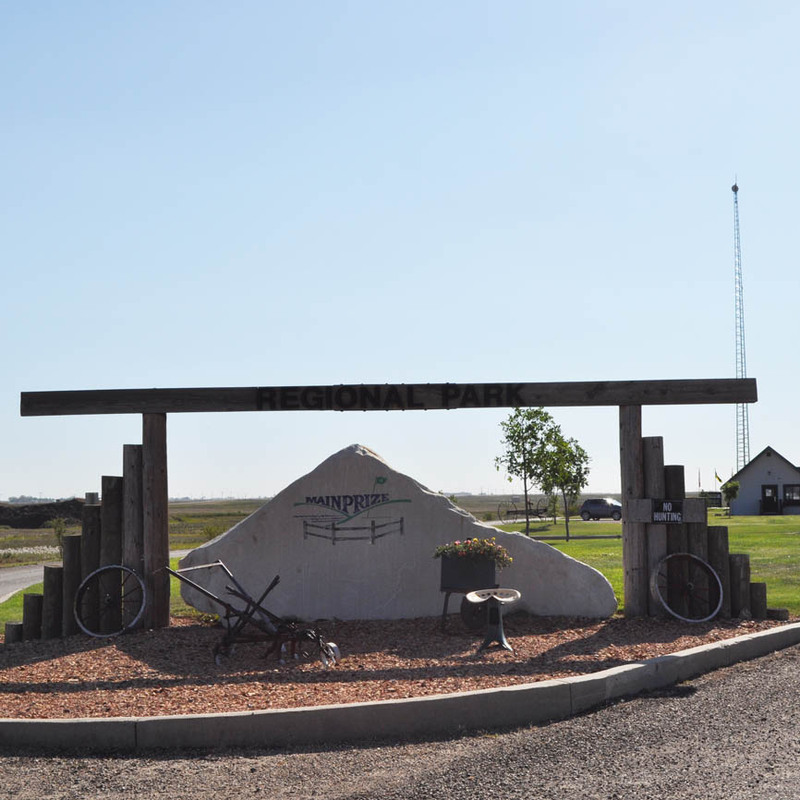 The old Regional Park was formed in 1961 and was located in the Souris River Valley west and south of Midale. The building of the Rafferty Dam at Estevan flooded the valley which meant the end of DOC'S OLD PARK. A new location upstream 5 kms, on to higher ground, was selected and now the park compliments the 55 kms of water created by the dam. Over 20 million walleye were stocked in the reservoir (1992-1999). 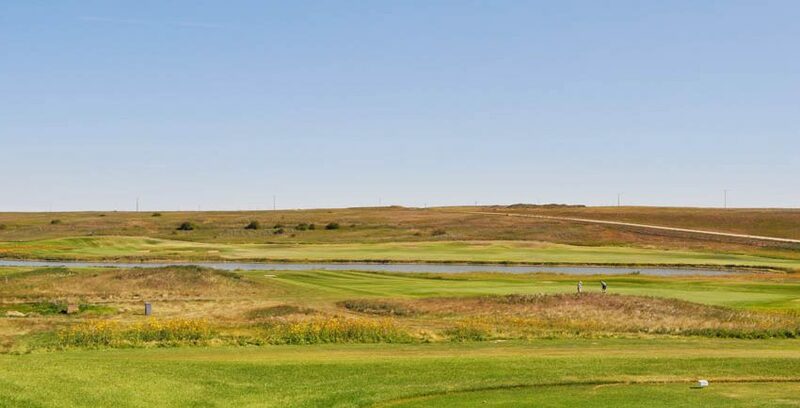 Subdivisions were started, an 18 hole golf course was opened, campgrounds and overnight accommodations have been developed along with many other services. 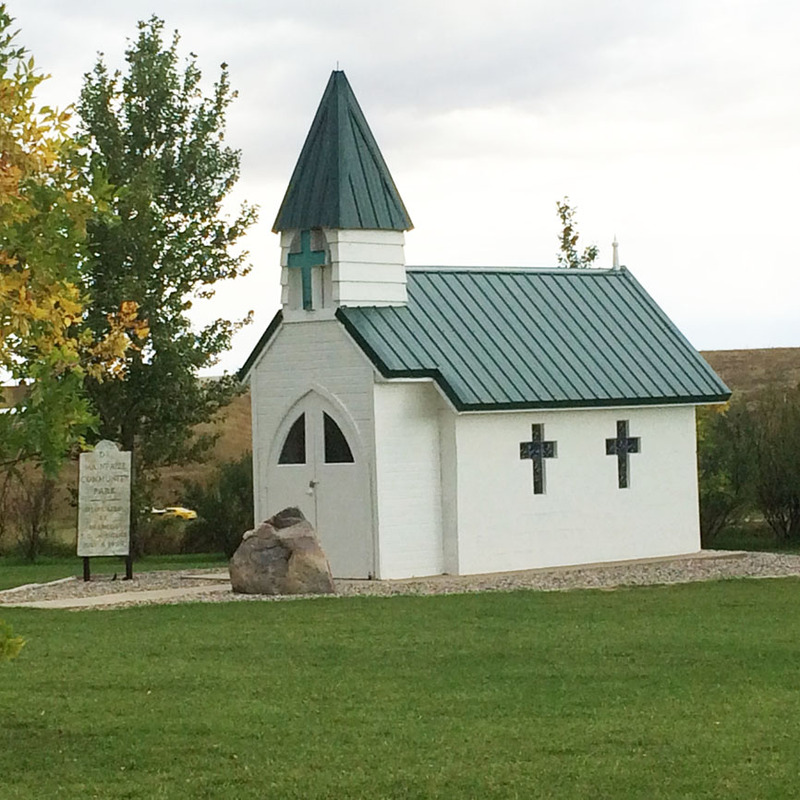 Doc's little church was purposely located in the center of the new park to ensure he is continuously watching over us. Domestic animals on leash at all times, animals are not allowed on the beach or in public buildings. Pooper scooper rules in effect. Fireworks are not allowed in the park unless cleared by Authority. The harbour area (lake) is considered a boating “no wake zone”. Discharging grey water or septic from an RV anywhere in the park other than the RV disposal site will result in immediate eviction. Trail bikes are not allowed anywhere in the Park. Power carts, quads and side by sides: To operate within the park all units must be registered, plated with a special park plate, carry a copy of a liability insurance (min. one million dollars). 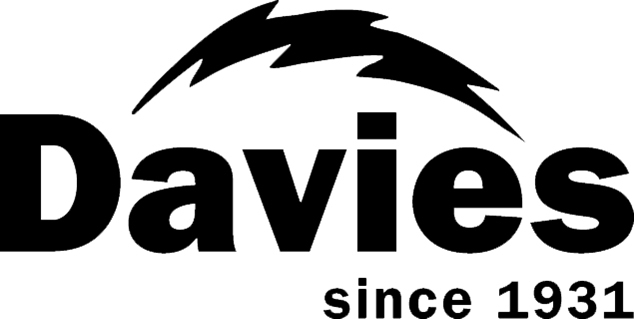 Operators must be 16 years old with a valid drivers licence, operators must abide by all posted speed limits, only carry passengers equal to the number of available manufactured seats and operators must abide by the Saskatchewan Traffic Act & the Saskatchewan ATV Act. 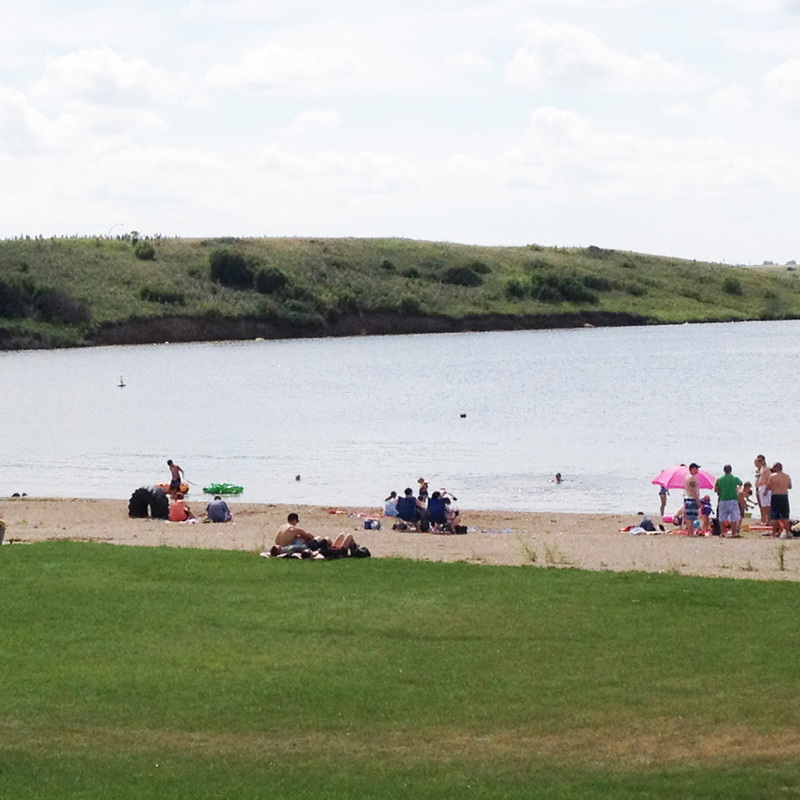 The campground is located within a 10 minute walking distance from the golf course, store, beach and boat launch. 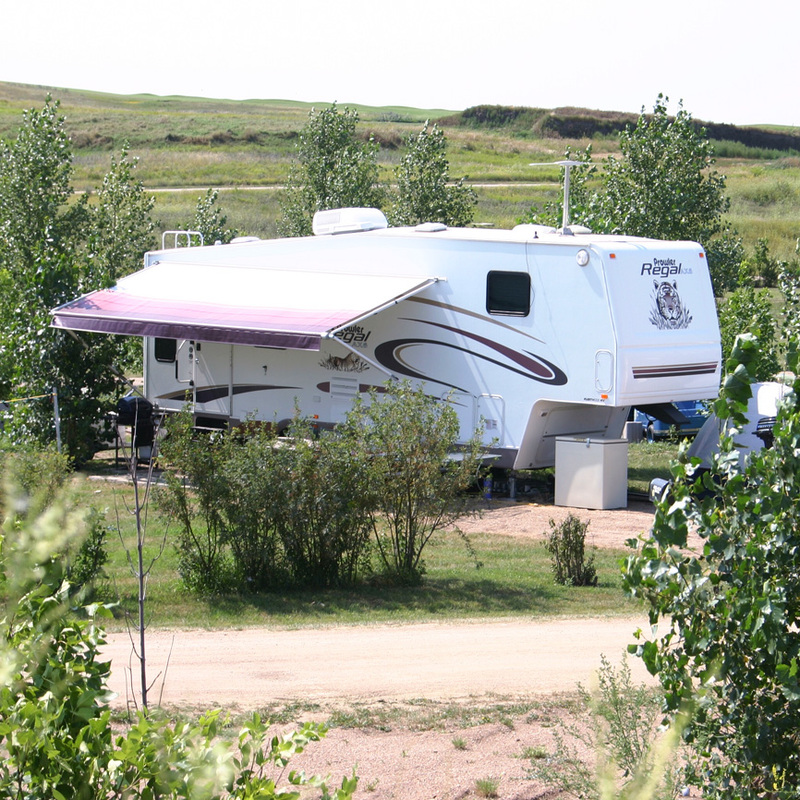 The campgrounds include: 190 full service sites all occupied by full season tenants, 50 short term sites which include 30 amp with water, 30 amp only and 15 amp only. Bathroom/shower facility is located in the centre of the campground. 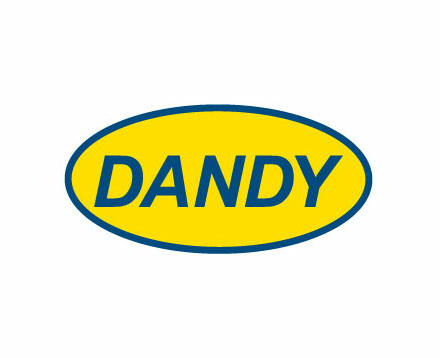 The facility is cleaned daily and is wheelchair accessible. 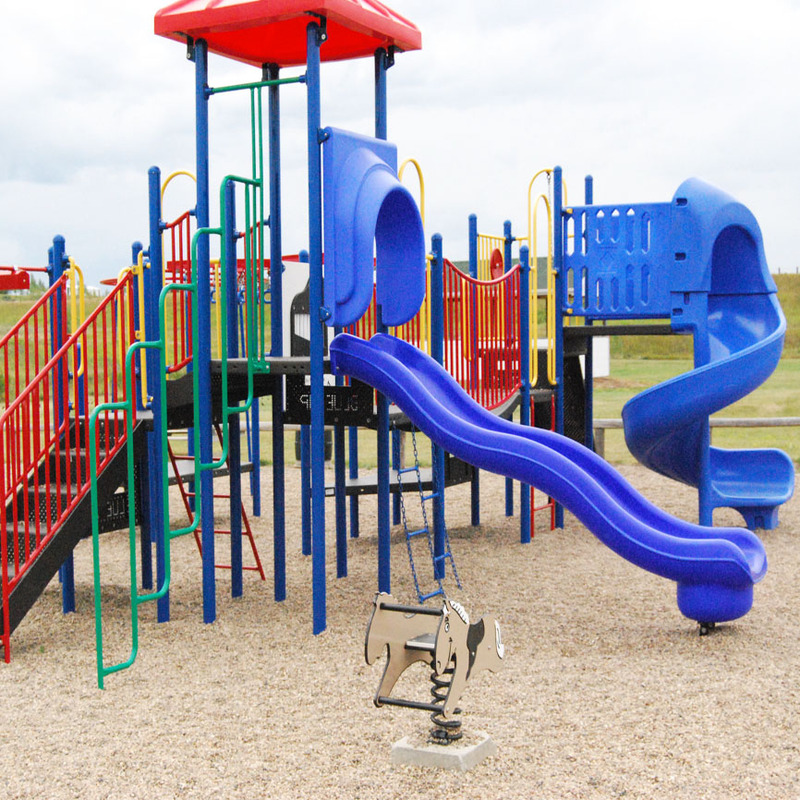 Two new playground facilities compliment the campground. Our group camping area has 4 electric pedestals with 30 amp and 15 amp outlets in each with potable water. There is a camp kitchen with a potable water outlet and a 15 amp power outlet at one corner. The camp kitchen compliments a fire pit on one side and the main playground area on the other side. A 10 minute walk will get you to the shower building, store, beach or golf course. 7 lots available, services: 100 amp power, potable water, irrigation water and full septic. Deep bury services which are good for year around use. A 5 minute walk will get you to the golf clubhouse, store, boat launch and beach. 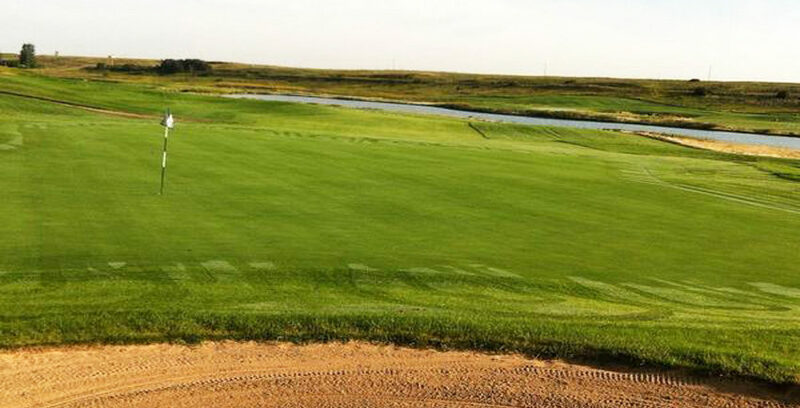 The golf course is a professionally designed links style facility. 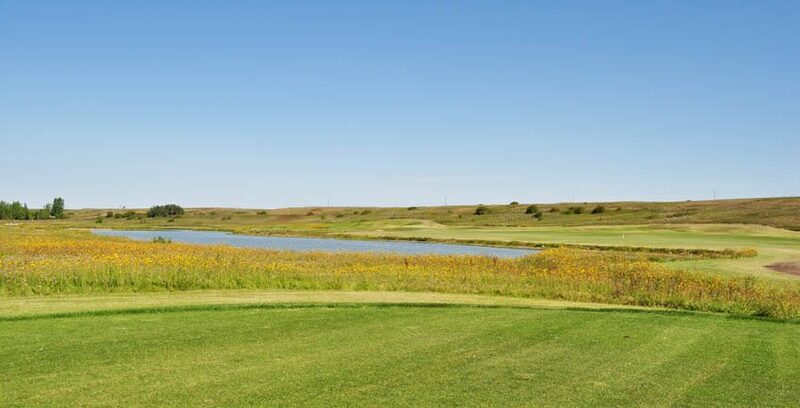 All 18 holes are in great condition along with the 3 practice holes that provide beginners and families with an experience free of the pressures of a normal golf course. 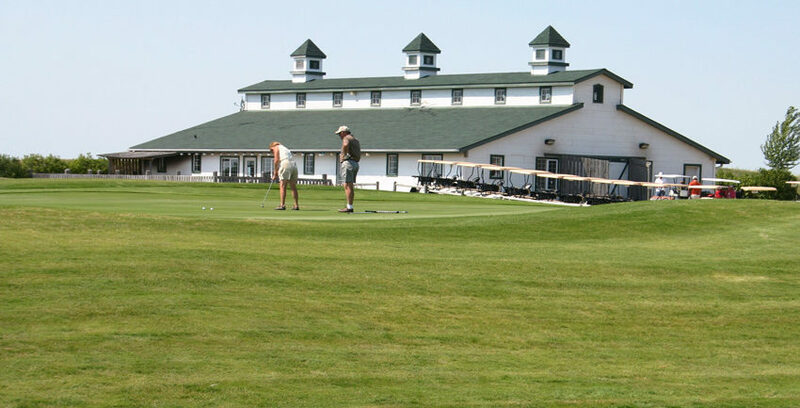 The western style clubhouse supports a pro shop, kitchen, licensed lounge and deck. The Pederson Place Building, adjacent to the clubhouse, provides 5000 sq. ft. of indoor area plus 3000 sq. ft. of deck area for large golf tournaments and family reunions. 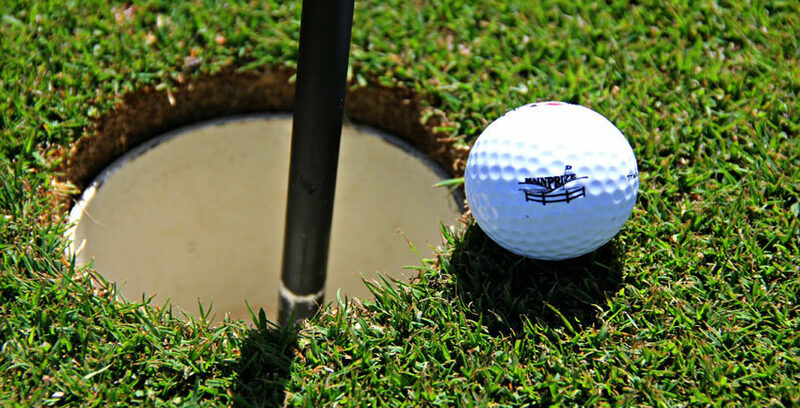 The course features a putting green, power carts, irrigated driving range. Four tee boxes on each fairway provide comfortable yardage for all levels of players. 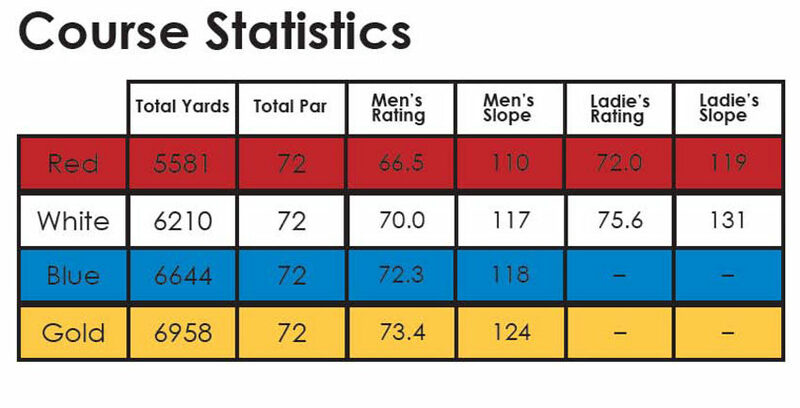 With a wide choice of yardage and faster speed of play, this facility is a great place for your company or group tournament. The man made beach is located along the north shore of the harbour directly across from the store and boat launch area. Next to the water is a generous area of sand, complimented by a half an acre of irrigated grass, to play your favourite game on or to just lay back and take on some rays. A beach volleyball net is situated on the sand. Within the grassed portion there are 6 picnic shelters equipped with fire pits and picnic tables. For wheelchair accessibility a cement sidewalk runs down the middle of the grassed area right to the sand. There are men and ladies change rooms, bathrooms with flush toilets and two outdoor showers adjacent to the grassed area. 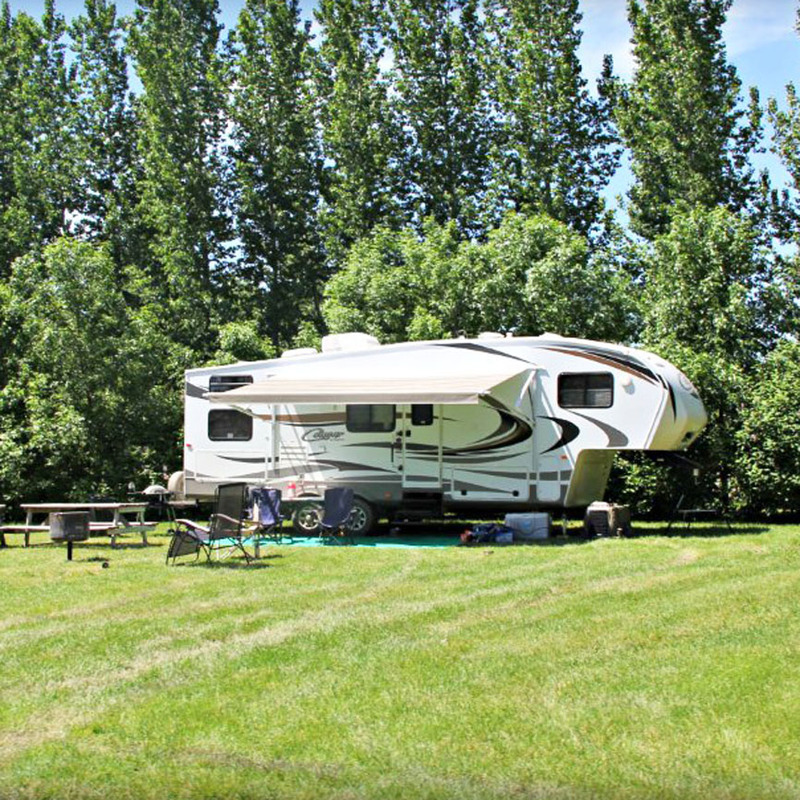 Ample parking space is available right next to the picnic shelters and is accessed by a road from the store, a road from the Harbour View Subdivision or from a cart path leading to the campground. There is no lifeguard on duty and we do not offer swimming lessons. 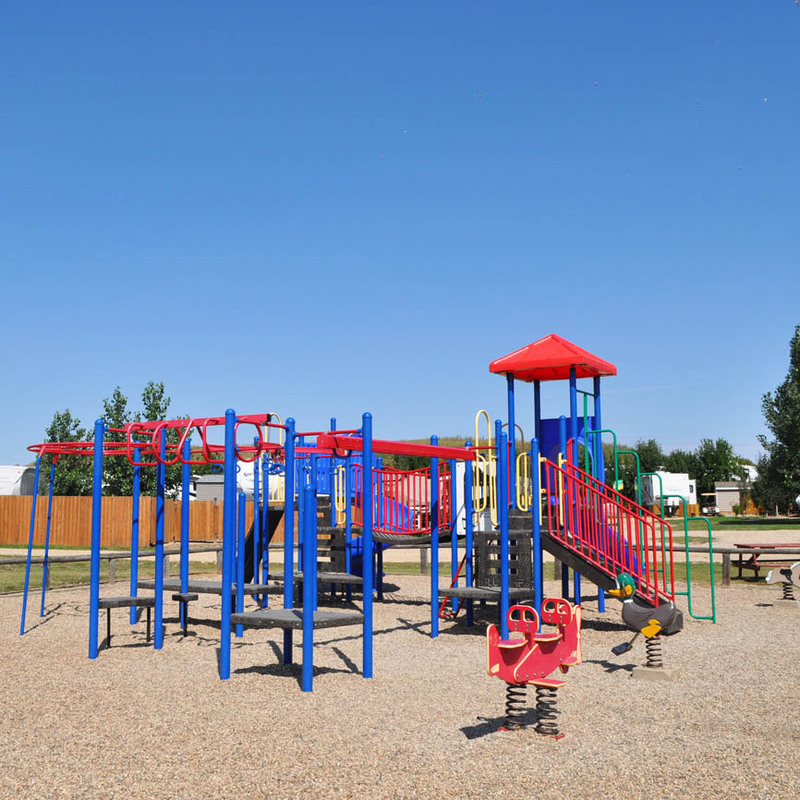 The parks 2 main playgrounds features new Blue Imp play facilities that offers recreation for all ages of children. The new playground is located beside the shower/bathroom facility in CAMP C and the other is located beside CAMP E. The ball diamond is located in the bowl area and the secondary diamonds are located next to the Woody’s Flying Field. The flying field is an area of manicured grass where the locals test their skills in operating remote control air craft. 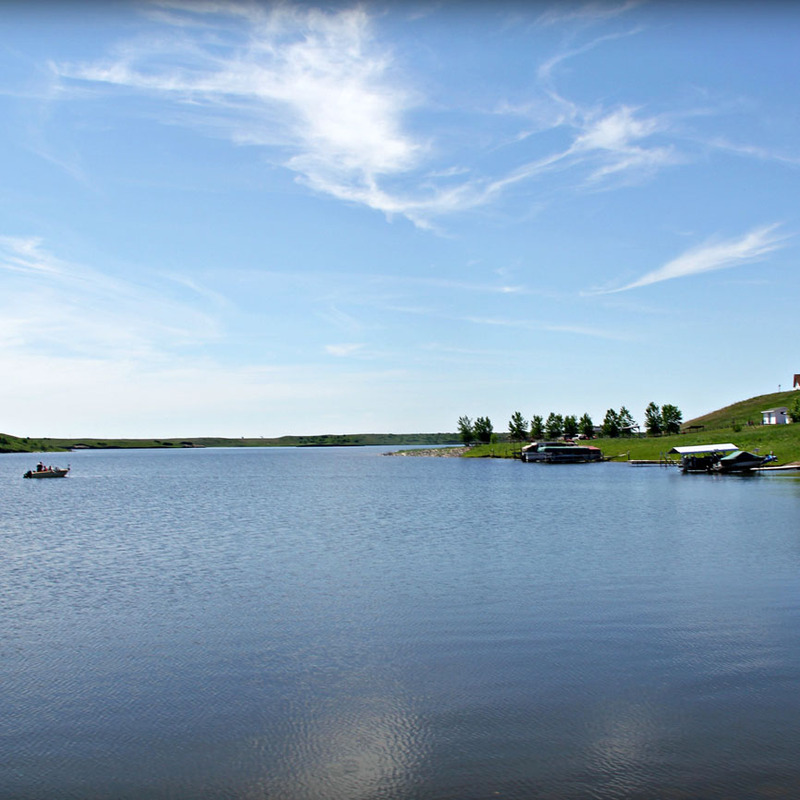 For anglers and recreational boaters, the boat launch facility at Mainprize has become a major access on to the 55 kms of water provided by the Rafferty Reservoir. The Park itself is located on the shoreline where the three source rivers (Souris, Roughbark and Jewell) meet and flow into the Rafferty. The fish stocks (walleye, pike, and perch) have matured over the years and to date some of the walleye have reached 9 lbs. and pike up to 34 lbs. The rivers and the numerous bays offer miles of unexplored shoreline for canoeist and kayak enthusiasts along with excellent habitat for the Grebe, Cormorants, numerous species of Ducks and Teals, White Pelican, Canada Geese, Mule Deer and the occasional Moose. Wildlife observers have remarked that it feels like they have touched nature by the hand. The numerous winding inlets and sandy points provide skiers and wake borders with their own private beaches or a group of anglers with a nice quiet spot to have a swim and cook up the mornings catch. We converted the old “Chandler Rail” bed into a walking trail! This rail line ran through the Souris Valley years ago. 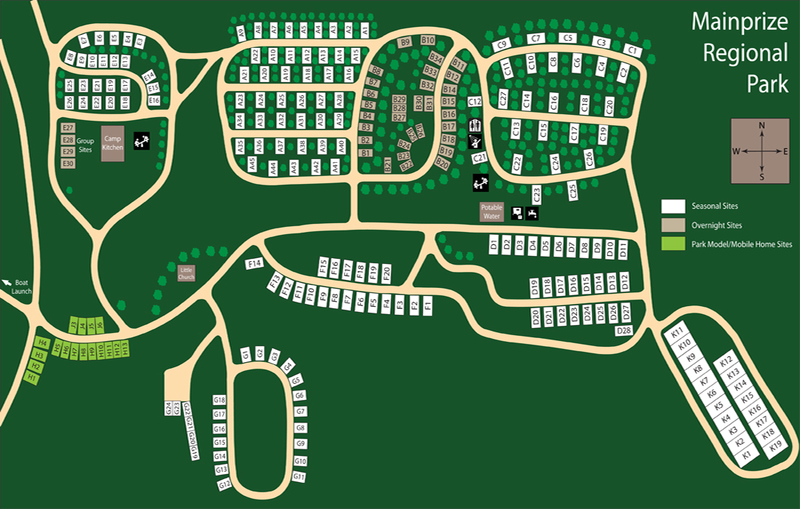 A section of it runs right through the park and forms the northern boundary of our entire campground and two fairways on the golf course. It is approximately 1 km long and gives you an elevated view of our camping facilities and a portion of the golf course. 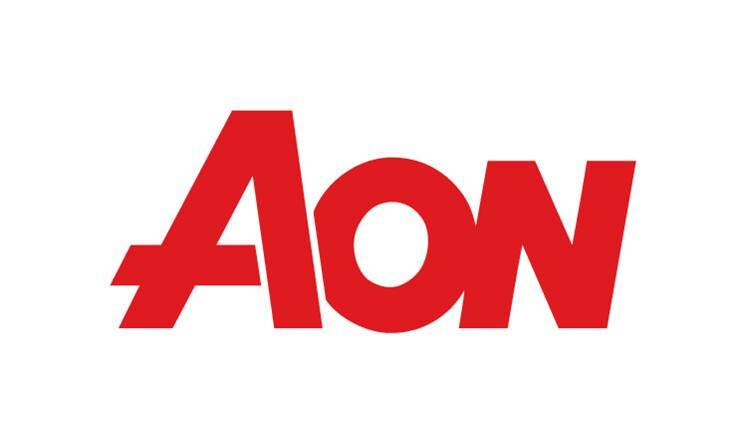 $5.00 non-refundable reservation fee plus complete payment on length of stay at time of booking and any changes will be considered another $5.00 non-refundable reservation fee. Valid credit card required. Person registering a campsite must be 21 years old, unless accompanied by a parent or guardian. Minimum 3 nights booking on long weekends. Long term bookings (minimum 1 week) will be accepted starting October 1st of the previous year. Short term bookings (less than 1 week) for the present year will not be accepted till January 15th of that year. 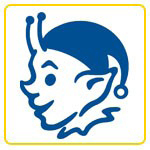 Specific sites will not be guaranteed until after January 15th. 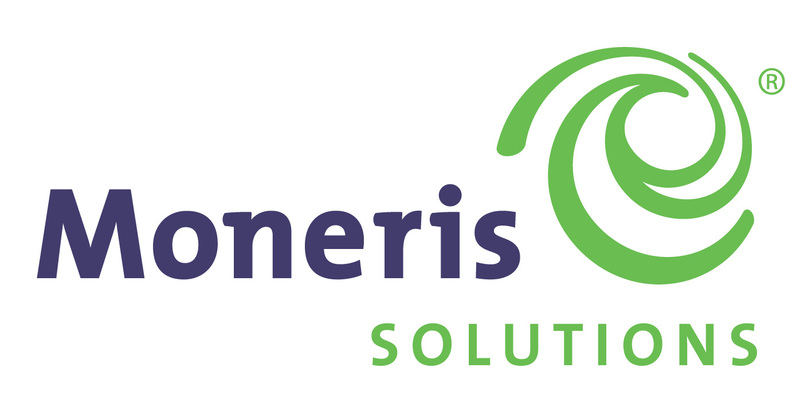 48 Hours cancellation notice required for regular weekends and 1 week cancellation notice for long weekends.